I have previously written about two other historical antecedents to Trump: the Know-Nothings and "Redemption." But there is a third parallel that is most apt: Senator Joe McCarthy. McCarthy was born in Wisconsin to poor farming parents who had immigrated from Ireland. His schooling was erratic, since he helped his family on the farm, but he managed to put himself through college and then law school. After a few years of practicing law, he ran as a candidate for judge in 1939 and won, succeeding in the race in part by lying about his opponent's age. His judicial career doesn't bear discussing -- although it has to be said he didn't exactly shine -- and it ended when McCarthy volunteered for the Marines when America entered World War 2. He was a briefing officer with no combat duties, but he volunteered to be a gunner/observer for twelve missions. He was injured during the war when he broke his leg at a party. After the war, McCarthy ran a failed Senate campaign, then took back his seat as judge while planning for a second run. This time, he won -- a victory that many attributed to attacks on his opponent for war profiteering. Senator Joe McCarthy started off quietly, giving speeches and working for a few special interests, but his real rise to power came when he started declaring that he had identified numerous Communists (205 of them!) who worked in the State Department and elsewhere in the government. In a country shaken by the Soviet development of a nuclear weapon and the revelation of several high-profile spies in the government, McCarthy's claim sparked a firestorm of press. McCarthy seldom provided any evidence for these claims, but they initially seem to have come from allegations made by a former Secretary of State to another Congressperson. The accusations were essentially unsubstantiated, since few of the accused still worked at State and all of them had undergone further security checks. But that didn't stop McCarthy. He seized upon this and other prior claims as "evidence," as though someone else's baseless accusations could constitute evidence for his own. Suspicion alone was all the evidence that McCarthy needed. Responding to McCarthy's rampant fearmongering, the Senate put together a special committee and held hearings -- the Tydings Committee. The hope by many senators was that McCarthy's allegations would fall apart under scrutiny. And, sure enough, he never substantiated them and the committee (and the full Senate) approved conclusions that cleared the State Department and its security procedures. Unfortunately, the opportunity to rant for hours at a time in the national spotlight didn't diminish McCarthy's standing. Rather than implode, McCarthy swelled. While his approval in Wisconsin wasn't great, he had achieved national standing and was widely regarded as one of the most prominent figures in the Senate. He was helped by the fact that he was Catholic and America's large Catholic community was just beginning to flex its political muscles (including the Kennedy family, which supported him). And after he was re-elected, he was put in charge of a major committee -- not the security committee he would have preferred, but one with enough scope that he could start holding his own hearings. McCarthy's committee began holding prominent investigations of different institutions, focusing particularly on those bodies that could be expected to have some diversity of opinion. He investigated the Voice of America radio station run by State and then the International Information Agency system of libraries. Unsurprisingly, he found some broadcasts and some books that could be characterized as "communist." It made for even more national exposure and strengthened the public perception that there really was some sort of communist conspiracy. Having met with success -- if hysteria, rumors, and scapegoating of innocents can be called such -- McCarthy turned away from the State Department to the Army. As before, he seized on already-existing accusations in order to inflate his own profile. Maj. Irving Peress was a dentist enlisted in the Army as a medical professional, but who had failed to satisfactorily answer questions on a standard Army "loyalty review" form. Accordingly, he'd been discharged. McCarthy made a show of "investigating" the case, even though there seemed to be no mystery and no scandal, raking Peress over the coals as a witness and blasting the Army's handling of the case. In the process, though, McCarthy made some enemies in the Army; not longer thereafter, the Army officially accused McCarthy of using the investigation process to apply pressure on senior officials to promote one of McCarthy's friends. McCarthy's own committee was set to adjudicate the matter. It would prove to be the end of his career. McCarthy had always seem invulnerable. He wasn't, but he did have a special power: Joe McCarthy could not be shamed. With a straight face and despite incontrovertible evidence, he would declare that he'd flown 32 combat missions during the war, had been wounded in the line of duty, and that he was the recipient of numerous awards for heroism. With a steady voice and despite clear contradictions, he would denounce vast legions of the innocent as communists. With a clear conscience and despite all reasonable dissent, he would do evil things and rejoice as it gave him power. As long as there was a shred of ambiguity -- some thin thread on which to hang his accusations -- McCarthy didn't stop. He blustered and bullied, and his fans loved him for it. They were willing to forgive any exaggeration or extremity as long as he was on their team and seemed to be dominant. But when your power comes from an illusion of your mastery or the prevalence of prejudice, it is a fragile thing. McCarthy found that out when he went up against the Army... and for the first time, after years of claims and bluster, the American people saw him clearly. Senator Stu Symington, focused and prepared and calm, took him apart like a roast chicken. Edward R. Murrow did a feature on McCarthy, found him to be a crude liar, and denounced him for a dangerous fool. And attorney Jack Welch leapt to the defense of an innocent young lawyer, Fred Fisher, in words that rang as clear as a bell with their passion and scorn. Almost like magic, McCarthy became a figure of contempt for most of America. His majority support inverted, his allies in Congress abandoned him, and everyone in the country suddenly felt free to criticize him without fear. The Senate officially censured him. Joe McCarthy served out the remainder of his term, to be sure. But his spell was broken and his power was over. He launched no more investigations. He destroyed no one else. His day was done, and he and his supporters were thrown down. His name became a pejorative. We don't know the hour or the day. It might not happen with some grand confrontation or speech. This time, there might not be a handful of brave heroes... there might be millions. But it will happen. After all, this has happened before. Who are you going to trust? Me, or your lying eyes? The president does not appear to know much about policy. With few exceptions -- most notably real estate and construction, for understandable reasons -- he seems to be wholly ignorant. Even worse, he doesn't seem to care about his ignorance, believing that everything boils down to his nebulous skill of "deal-making." To Trump, every disagreement comes down to the displays of dominance that guide his approach to conflict. Why bother learning anything if everything is the same? In other words, outcomes don't seem to actually matter to the president. Only appearances matter. The question is only: how true is this for the rest of America? The ignorance has been obvious from the start, of course, even to Trump's supporters. Unwilling or unable to study the basics facts of foreign policy or domestic policy, he spoke throughout the campaign in broad generalities. He relied on bluster and the charity of others to muddle through. His health care policy was always some formulation of we're going to get rid of the lines around the states and we're doing to do great deals. Challenged on specifics, like the inherent problems of selling insurance across state lines (an immediate race to the regulatory bottom), Trump would just scoff and assert that it would be so easy to come up with better care for less money. And sure enough, the Trump White House has proven not to have any actual position on healthcare -- they just let the House write out without offering any input, and endorsed the result. What is he going to do about NAFTA? Well, he's going to make a great deal. What about infrastructure? It'll be a great deal. A huge, massive, great deal. And then he segues into complaints about poor negotiators from years past, or obstruction, or the "mess" he was left, or distracts by talking about something unrelated. Obviously, his strategy has often worked. It got him elected, after all (in addition to unscrupulous attacks on Hillary Clinton, James Comey's poor judgment, hyperpartisanship, and the intervention of a foreign power). 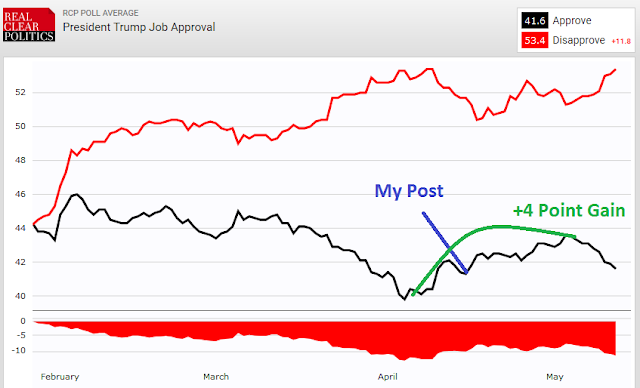 Many folks are entirely willing to fill in the gaps for themselves, or to assume that there's substance behind Trump's bluster, or just not informed enough to see the problem. But where is the limit? How far can it take him? This is one of the big things that has worried me this year. It's a fascinating question, really: is it possible for an administration to convince its supporters to accept their narrative instead of the reality around them? The economy is the most prominent example. Presidents are capable of badly damaging the economy, but any positive contributions are minimal and long-term. It's pretty easy to screw the economy up, and pretty hard to boost it. But after spending years attacking the "fake" unemployment numbers and job growth during the Obama administration, this president is forced to abide by his own fiction. Thus, a sudden reversal: the White House extravagantly praised the February jobs numbers, when the economy added 235,000 jobs, even after scorning an even higher number in December of 2012. Reporters laughed. Democrats cried hypocrisy (and also pointed out that these numbers couldn't conceivably be the result of any Trump policy). But Trump supporters... "GREAT AGAIN! February Jobs Gains Rocket to 235,000 as Unemployment Ticked Down." This has been a serious concern of mine. I have always thought that it will all be okay, but Trump would be able to do significant damage if he just managed to hold his base -- and blithe falsehood might be the way to do it, especially when combined with showmanship. Turning on a dime and claiming that the exact same mediocre economy is suddenly doing well is hypocritical, but your own tribe can turn a blind eye. Dropping a very big bomb and bragging about it is play-acting machismo, but machismo does impress some people. Bullying one company into keeping its factory in America might not stem the slow ebb of manufacturing in the country, but it's very flashy. Can it work? Can style win over substance in this country? Comfortingly, the early evidence seems to indicate that it will not succeed. I had hoped that the divergence between reality and spin would become too great to ignore, even for Trump's supporters, but I worried that the process might take years. Instead, it's taken months. Example #1: The American Health Care Act (AHCA) is a terrible bill. It also directly contradicts some key campaign promises by the administration, since it cuts Medicaid, endangers people with pre-existing conditions, and has no hope of lowering the actual cost of care. The administration put all of its weight behind the bill and tried to sell it as "terrific" and a "great bill" that would "take care of everybody." And it didn't work. The AHCA remained unpopular with Democrats and Republicans. It's still unpopular today, even after its passage through the House. The blustering ignorance that led Trump to endorse such nonsense was not able to overwhelm the reality of the bill or the threat it poses. Example #2: The president's termination of FBI Director James Comey was a horrific breach of ethical norms (even though he deserved it) since it took place during an investigation of the administration, especially since even the president has admitted that his desire to curtail the investigation was a factor. But more than half of Americans -- 54% -- think it was inappropriate. That number must include a sizable chunk of Trump voters who aren't buying the administration's incompetent spin. The attempt to control appearances and make this look like decisive dominance is overwhelmed by the facts about the context. Most Americans are not buying the style, but instead are looking at the substance -- and they are making these judgments in such numbers that it is apparent that even some of the Trump base are peeling away. The showmanship isn't working. People have their eyes open and are looking at reality. And folks, let me tell you something: reality is not Trump's friend.